Mine Cart Ride is a minigame found in Donkey Kong 64, and is the only minigame in this game without an alliteration in its English title. There are three Minecart stages in the game. One for Diddy Kong in Jungle Japes, another one for Chunky Kong in Fungi Forest, and the last one can be found in Creepy Castle for Donkey Kong. During the ride the Kong can tilt his minecart or jump to avoid obstacles, collect scattered coins near the rails, or activate switches. And in Donkey Kong's ride, he can jump to the side rails. If the Kong finishes his ride and collects a certain amount of coins, he earns a Golden Banana. A Krash trying to attack Diddy Kong. Diddy can enter the mine by shooting a Peanut using his Peanut Popgun at the Target Switch on the hill by the Bananaport Pad 2, which makes a spiral ramp appear, allowing him to enter an alcove. Deep inside there is a machine, which Diddy can Chimpy Charge the slow button to make the conveyor belts go slower allowing Diddy to reach his minecart and enter the ride. After entering the minecart, Squawks the Parrot will tell the player to collect 50 coins to win a Golden Banana. Shortly after, the Diddy will find another minecart with a Krash in it. The Kritter will try attacking Diddy with a club, which he must jump to dodge. After that, Diddy will then climb down a hill with some turns. Next, the player will find two green dragon hands, as some fire appears on and off. After dodging the fire, the Diddy will go through a door, shortly after a Krash will appear. Later, Diddy finds a Kaboom on the upper mine track, who will try to fall on Diddy, he will need to Slow down to dodge it. After that, Diddy will come to a Crossroads, the switch on the right changes the open door. Later, the player will find the dragon's head, whose mouth opens and closes quickly. Diddy will need to go in the dragon's mouth, finding three more Kabooms inside. After that, there is another downhill. Following that, the player will find some more mine tracks, this time with TNT minecarts. Diddy can dodge it by jumping. Shortly after, another purple Dragon can be found, it will open its mouth as soon as the player approaches it. After Diddy enters its mouth, he will find some more TNT minecarts, followed by two more crossroads. After that, Squawks will appear and reward the player with a Golden Banana if they have collected 50 coins. This challenge is one of the few randomly selected options in the kiosk demo for Donkey Kong 64 when starting the game. There are a few notable differences, one of them being that Diddy must collect 70 coins rather than 50, which significantly increases the difficulty. Another one is how most of Squawks's dialogue is different. 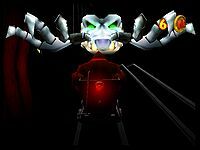 One of the first publicly revealed Donkey Kong 64 screenshots appeared to be of Diddy's Mine Cart Ride as the screenshot shows him riding his Mine Cart away from an adjacent Krash. Chunky Kong entering a cave. After Chunky enters the well in Fungi Forest clock area, he will come into a cavern, some pillars will fall on Chunky, There is a green bell, once touched, the portcullis will open, otherwise Chunky will be hit from the door. Shortly after, some rocks will fall and there is a crossroads, with a switch on the right. Later, Krash will show up trying to attack the player, there is a switch on the left that makes rocks fall on Krash making him unable to continue chasing the Kong. Shortly after, Chunky will get out of the cavern into a place containing some mushrooms and a river below. Next, Chunky will enter another cavern, with two more green bells followed by a red bell. Touching the red bell will result in the portcullis closing, hurting Chunky. Another green bell will appear, and then Chunky will come out of the cavern. Some trees will fall on Chunky. Shortly after Chunky will jump into another cave. The cave entrance is shaped identical to the statue in the catacomb of Jungle Japes. Inside is two tracks that overlap with each other, some TNT Barrels roam inside. Chunky must jump to dodge them. Later on, Chunky will climb a downhill, while he is climbing some Krashes will come from the front on the other track trying to attack with a club. Shortly after, some portcullises will open and close repeatedly, Chunky must slow down or speed up, so he can cross safely. Another green bell can be found. Outside there is a falling tree and a monster statue with teeth like door that repeatedly shut down and open up. Inside is a downhill that Chunky descend at full speed. Followed by some turns and a door and some more falling pillars. Another Krash will appear. Later there is a crossroad this time there is 3 ways, by default the only one open is the one in the middle, however there are two switches that can switch the open door. If Chunky enters the middle he will face a door like a dragon's mouth. Shortly after all three rails merge and Squawks will appear rewarding Chunky with a Golden Banana if he managed to survive with 50 coins. Resident Demon in Donkey Kong's Mine Cart Ride. Inside the Creepy Castle's catacombs, there is a closed door with a Coconut Target Switch, after shooting the switch with the Coconut Shooter and pulling some levers in a specified order (top-right, top-left, bottom-left). The door will open. After entering, the player will come into multiple doors. Later the path will split into two, and the Resident Demon will appear trying to attack Donkey Kong, If he is hit, he will lose three coins. Later on, Donkey will enter another door and find three R.I.P. rocks that raise suddenly, He must jump from the track to the other track to dodge each one. Next, the Resident Demon will reappear, After some time, the track will split into three, the Resident Demon will then fire some Roller Coasters, which carry TNT Barrels. They can be avoided either by slowing down and jumping, or speeding up until they explode on their own. The rails will re-merge into two again, and some metal gates will appear similar to the portcullises in Chunky Kong's version, they can only be avoided by jumping right or left. Shortly after, Donkey will enter some doors and find three more R.I.P. rocks. Back again, the Resident Demon will attack Donkey, Next the player will enter another door with five more R.I.P. rocks. After that, Donkey will come out of the door, and the rails curves upwards, Donkey will climb it, and switch direction and back into the same tracks. After the player reaches the start again, Squawks will appear and give Donkey a Golden banana if he collects 25 coins. ↑ "Diddy's biggest challenge in Jungle Japes is the Mine Cart Ride. ", Official Donkey Kong 64 Nintendo Power, page 29. This page was last edited on April 14, 2019, at 22:16.